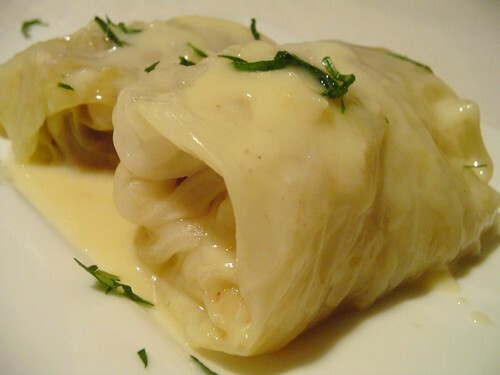 Lahanodolmades (Stuffed Cabbage with Avgolemono) – Elly Says Opa! For as much as I enjoy food, I can pick what are probably my two favorite dishes with little hesitation: Greek-style stuffed cabbage with egg-lemon sauce (lahanodolmades avgolemono) and roasted lamb with tomatoes and orzo (arni youvetsi) with lots of grated myzithra. But, I tend to not make these dishes at home and wait for my yiayia to make them when I visit Michigan (she takes requests, of course). Tom is not that crazy about cabbage, so I usually make youvarlakia, which are almost the same thing as the dolmades but without the cabbage. And roasting lamb just doesn’t make much sense when there are only two people in the household. So, unfortunately, I don’t eat my two favorite meals all that often. But, lucky for me, Tom *will* eat anything. In fact the only thing he doesn’t like is Grape Nuts cereal, which he professes tastes like gravel. He likes almost everything else, and things he feels just sort of “eh” about (like cabbage), he will still eat. And hey, I can always eat the cabbage from his plate if he doesn’t want it (much like I did with my dad’s plate, when I was younger). I have been majorly craving some lahanodolmades (LA-hah-no-dole-MAH-thes) lately, so I decided to make these. In general “dolmades” refer to stuffed grape leaves whereas “lahanodolmades” are stuffed cabbage (lahana = cabbage). I much, much, much prefer lahanodolmades with avgolemono over the tomato sauce many versions of stuffed cabbage tend to have. Plus, it’s really the only way we made them in my family. These are really easy to make vegetarian by simply removing the meat. Normally I don’t thicken my avgolemono with flour or cornstarch but that’s because generally I am making something more soup-like whereas this is more sauce-like so I do add the cornstarch here. fresh dill, to taste–but don’t be stingy! fresh parsley, to taste–again, don’t be stingy! Bring a large pot of water to a boil and add some salt. Meanwhile, peel the outermost leaves of the cabbage off and then, with one hand on the cabbage to steady it, use a small paring or utility knife to cut around the core of the cabbage. Pop the core out with the tip of your knife (basically you will have a hole in your cabbage). Then, add the cabbage to the boiling water and boil until the leaves are tender, about 10-12 minutes. Carefully peel the cabbage, layer by layer, reserving the leaves. If they are big, feel free to cut them in half. In a pot or dutch oven (I just use the same one as I did for the cabbage), put some sort of layer of vegetables on the bottom. You can use some of the leftover cabbage leaves, onion, lemon slices…today I did a combo of all three because my onion was too large to use all up in the meat mixture and I had some torn pieces of cabbage. Lightly mix your ground beef, rice, beaten egg, onion, dill, salt and pepper until the ingredients are incorporated. Lay a cabbage leaf flat on your work surface and place about a tablespoon or so of the meat mixture at one end of the leaf. Tuck in the sides of the leaf and then proceed to roll it up. Place the rolled up cabbage seam side down on top of bed of veggies. Continue stuffing/rolling the remaining cabbage and placing them next to each other in the pot. When you have one layer completed, make another layer of the stuffed cabbage. After you have made all your rolls, pour water or broth into the pot. The cabbage rolls shouldn’t be submerged completely, but you should be able to see the liquid coming up from the sides. I also place an inverted plate on top of the rolls, to keep some pressure on them so they don’t open during cooking. Bring the broth to a boil and then cover, reduce heat to low and simmer for about 60-75 minutes, until the cabbage is very tender. To make the avgolemono, mix together the eggs and lemon juice and then add the corn starch to make a slurry. Take a few ladles of the broth from the cabbage rolls (I like to take out all or most of the rolls before doing this, just because it makes it easier on me and you can also pull out things you don’t want to eat, like if you used lemon slices), and slowly add it to the egg-lemon mixture, beating continuously. Then, add the avgolemono into the pot, again stirring continuously. Season to taste with salt and pepper.